What I did get was a very engaging story (adapted from the novel “The Wettest County In The World”) about three brothers making a living running moonshine in Franklin county, Virginia during the prohibition era. 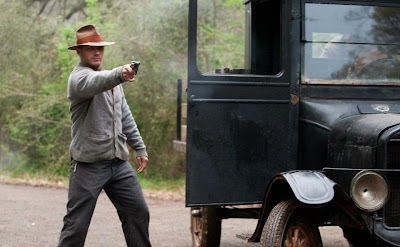 Forrest Bondurant (Hardy) is the oldest of the three and is very good at perpetuating a local legend about himself and his brothers in how they are truly immortal and therefore unstoppable in their trade. Howard (Jason Clarke) is basically the enforcer and has every muscular trait that Jack (LaBeouf), the youngest of the three, is sorely lacking. Everything seems to be going just fine for the brothers and their burgeoning business and especially when Maggie Beauford (Chastain) walks in to their lives straight from Chicago looking for a quiet place to settle down. She takes a job in the brother's store and takes residence in a hotel which is also newly housing another transplant from Chicago who is nowhere near as welcome of a presence. Special Deputy Charles Rakes (Pearce) has been brought in as an agent of those that wish to receive a cut of the moonshine business and is under instruction to permanently shut down anyone that does not wish to cooperate. With all the pieces firmly in place and an inevitable showdown on the horizon, the Bondurant brothers must decide how they will proceed although each has their own aspiration and desires which ultimately causes some internal conflict of their own. With Rakes having converted or shut down every bootlegger in his path, he now sets his sights on the three indestructible siblings to complete his mission of creating a mafia style hierarchy like what he and his cohorts have enjoyed in the big city. What follows is a seemingly never ending trail of dead bodies, bullet casings, and blown up moonshine shacks that will change the course of Franklin County history forever. "Lawless", which is based on a true story, is first and foremost a brutally honest portrayal of what life must have been like during the time period. Obviously I wasn't there (I'm not that old!) so I don't know first hand, but director John Hillcoat does a great job of giving the movie a real raw and gritty feel which is very similar in style to his other major film, "The Road". The characters are all very authentic and the performances are all very impressive with Tom Hardy being the major standout. After playing the likes of Forrest Bondurant, the iconic Bane character from The Dark Knight Rises, and MMA fighter Tommy Conlon in Warrior, I have him at or near the very top of the best actors working today. The one thing that is holding me back from calling this a truly great picture is the fact that Mr. LaBeouf is front and center in what is really the lead role of the film. Jack goes through a whole lot of stuff over the course of the movie and his growth as a man is a major driving force of the story. That being said, and maybe this is just me, but every time I see him on screen I just don't believe him as the character he is playing. When you contrast that against the way Hardy dives so far in to a character you barely recognize him from one role to the next, a mediocre performance becomes that much more obvious. It might also be due to the fact that everyone else in the movie was just so good. From Guy Pearce, who really seemed to play up the fiendish villain role, to Gary Oldman as a mob character that needed way more screen time. Throw in Jessica Chastain, who is currently on my short list of the most amazingly beautiful and talented leading ladies in all of Hollywood, and any complaints about the movie or the cast seem to become more and more trivial. 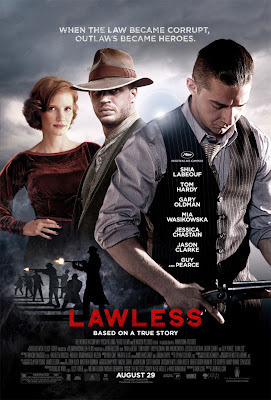 "Lawless" is, at its core, an historical drama about violence and greed during a time period where the law was secondary to brute force and strength of will, but what really stands out are the great performances given by an outstanding cast. Great review Marc. Loved the cast, loved the action, and loved the look, but I just didn’t love the pace. Too slow at times and could have been sped up just a bit.